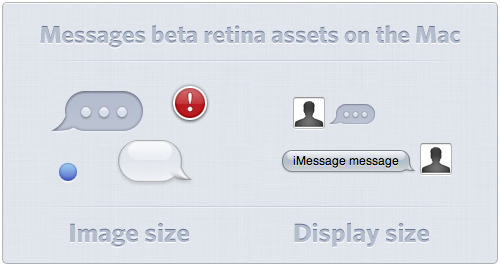 MacRumors discovered that the new Messages app beta includes some peculiar multi-part TIFF images. When examined with an app like exiftool, which digs into image metadata, the files are found to have descriptions with the “@2x” naming scheme. I found a few of the @2x images, and made the comparison above. These files all follow exactly the same naming conventions and design standards as Apple’s retina images included for iOS devices. 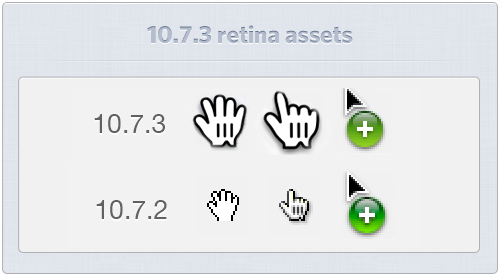 It’s solid evidence that retina displays are coming to the Mac. All of these new assets are exactly four times the normal size, meaning that retina screens would need to contain four times the number of pixels for objects to stay the same physical size on the screen. On a 15" MacBook Pro or 13" MacBook Air, that would be an increase from 1440x900 to 2880x1800 pixels. Those numbers are big, but they don’t seem unachievable. The biggest issue with the change would probably be in manufacturing the panels cost-effectively. Thankfully, Apple seems to be good at tackling that problem. This is exciting. Retina displays change the user experience in ways that are hard to articulate. After using an iPhone 4 for a while, the rest of the tech world seems dull.